Shirts With Random Triangles: DE Aaron Moffitt, Son Of LSU Strength Coach, Commits To Tigers. Moffitt is the son of LSU strength and conditioning coach Tommy Moffitt. 247Sports grades Moffitt as a three-star strong-side defensive end. The recruiting site ranks Moffitt at no. 41 among SDE prospects for 2017, at no. 47 among 2017 prospects from the state of Louisiana, and at no. 837 in its 2017 national rankings. 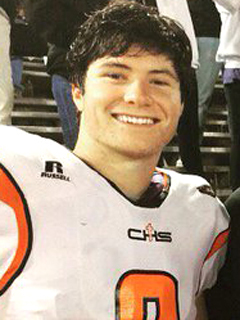 Moffitt attends Catholic High School in Baton Rouge, La. He stands 6'4, and weighs 255 lbs. He is the 11th commitment to LSU's 2917 recruiting class.